The Maya civilization were people who lived in Central America. They lived there for a long time and some of the Maya people live there even today. The Maya lived there 4,000 years ago (about 2000 BC). 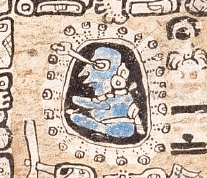 At that date complex societies were living in the Maya region. The staple crops of the Maya diet were cultivated. Their food included including maize, beans, squashes, and chili peppers. The first Maya cities developed around 750 BC. The Maya people used a written language before Columbus came to the Americas in 1492 AD. They were good at art, building, and math. They knew about stars and planets, which helped them make calendars. The Maya civilization was biggest between the years of 420 AD and 900 AD. The Maya civilization spread all the way from central Mexico to Honduras, Guatemala, and northern El Salvador. The Maya people traded with other people in the Americas. Their art and buildings have lots of different styles. This shows they traded a lot. They made changes to their buildings to make them even better. The Maya civilization started getting smaller after 900 AD. 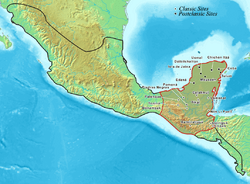 The Conquistadors arrived in the 15th century and took over Central America, even in the Mayan areas. However, the Mayan people still live there today. Their relatives can be found in the same areas the Mayan civilization used to live in. They even keep the old Mayan traditions and beliefs. There are many Mayan languages still spoken today, including one called the Achi language. A play called Rabinal Achi is considered important. The Maya civilization lived in three different areas: the southern Maya highlands, the central lowlands, and the northern lowlands. They had many different types of land, including mountains and dry plains. People living in the low plains by the sea were affected by hurricanes and tropical storms from the Caribbean. From about 250 to 909, the Maya civilization built many monuments and cities, and made lots of important carvings. The "southern lowlands" were an important place at the time. 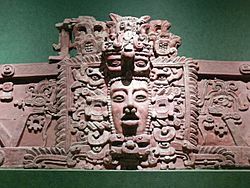 The Maya civilization made lots of discoveries about art and thinking there. Like Ancient Greece, their civilization was made up of lots of cities, which all worked in different ways. People gathered around these cities to farm. Well-known cities were Tikal, Palenque, Copán and Calakmul. 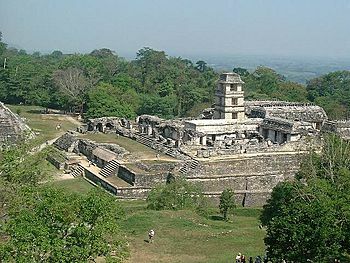 Lesser-known cities were Dos Pilas, Uaxactun, Altun Ha, and Bonampak, among others. In general, we know more about where the cities were in the south than we do in the north. 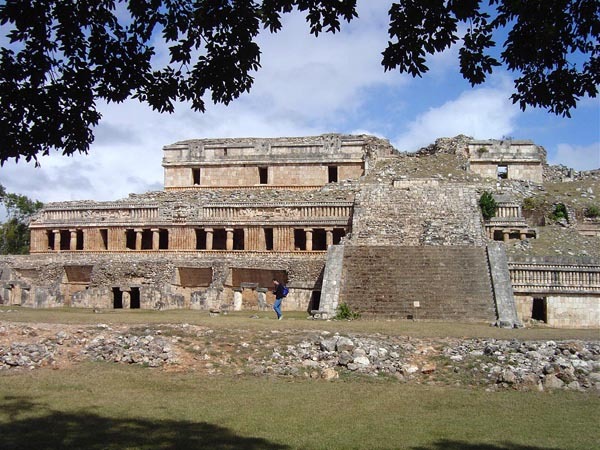 Some northern cities we do know about were Oxkintok, Chunchucmil, and Uxmal. Chichen Itza was the most important city in the northern Maya region. Zaculeu was capital of the Postclassic Mam kingdom in the Guatemalan Highlands. Mayapan was an important Postclassic city in the northern Yucatán Peninsula. Temple I, at Tikal, was a funerary temple in honour of king Jasaw Chan K'awiil I.
Maya script on Cancuén Panel 3 describes the installation of two vassals at Machaquilá by Cancuén king Taj Chan Ahk. Maize was a staple of the Maya diet. Mayan civilization Facts for Kids. Kiddle Encyclopedia.